I really think that one of the future enhancements that is coming down the line for all cell phones is some sort of augmented reality. We are already beginning to see the beginning stages of this in the cell phone market and it is quickly becoming integrated with navigational GPS. We did a recent article on a navigation GPS app for cyclists on the i-Phone called ARider. It is really only a matter of time before we begin to see some very interesting and very useful GPS tracking cell phones with augmented reality. The question is no longer if this type of thing is possibly, but when it will be cheap enough to be made available on the mass consumer market. Just think of the possibilities. A family could stay in contact with each other visually, spatially, and temporally. In order for us to see just how cool this type of GPS tracking technology will be we should come with some type of thought experiment that will allow us to wrap our heads around its coolness. We’ll assume that we have a family of 4 who all own cell phones. Mr. GPS is 45 and works as a high powered executive at a mid-sized paper company in the mid-Atlantic region of the Eastern United States. His wife, Mrs. GPS, works as a nurse administrator in a hospital in the center of the city. The couple live with their son, Wants-To-Be-Tracked, who is 11, and their daughter, Needs-To-Be-Tracked, who is 7. Wants is currently going to a college preparatory school, plays ice hockey on a traveling team, and loves to take their dog, Pet GPS, on long walks around their suburban neighborhood. Needs is a rambunctious little girl who loves to go exploring and is far too friendly with strangers. This typical, upper-middle class family is fragmented and finds itself spending more time away from each other than they do together. If you don’t count the number of hours that each of them sleeps under the same roof, they probably spend about 15-25 hours together each week. Most of this time is spent eating, watching TV, or traveling in a car together. This is a sad state of affairs, but probably typical for many in their situation. Anyway, this family is looking for ways to stay connected with each other and to make their lives more efficient. As it stands right now, it is hard for the working parents to know when their kids need to picked up and what they need to do each and every day. They have errands to run, children to shuttle, jobs to work, and a house to maintain. On top of all this, they are being bombarded by the media about all the terrible things that could happen to their children these days. In order to get all this done they need some technological help. This is where a cell phone that integrates GPS tracking technology and augmented reality can be a real boon for this family. Imagine that Mrs. GPS has dropped Needs off at the park with some friends for a play date. While she waits for the date to be over, she heads on out the grocery store to pick up some frozen meals for their dinner tonight. While Needs is with some friends, she is also prone to wander and the mother who is there watching the kids has been known to try and pick up men while the kids play. Mrs. GPS wants to make sure that Needs is safe and staying where she is supposed to be staying so she busts out here GPS tracking cell phone with augmented reality to see what is going on. Now wouldn’t that be cool? 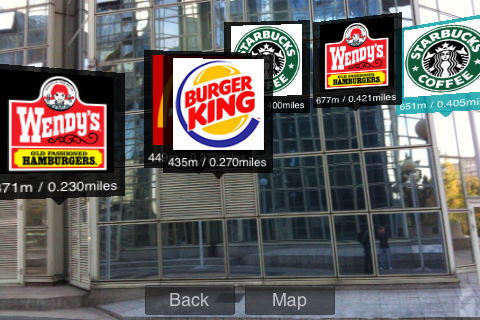 Well, that is only just one of several different scenarios where this type of augmented reality integrated with a GPS tracking cell phone could be extremely useful. Another is two lovers who want to make a make secret and spontaneous rendezvous. For this you would certainly need to let your lover track you and vice versa, but that shouldn’t be too much a problem if you are married to the person! Then, if you want to hook up with your spouse you just bust out your augmented reality cell phone and find out where they are in relation to you – then you head on over and track them down. This works particularly well if you are both at a large social function (like a club or party) or if you are in a park or other such venue. I recommend that anyone who is into this type of thing do this, it is like geocaching for love! You might also want to use augmented reality GPS tracking in order to stay in contact with your friends and meet up at fun and interesting times. At the same party but don’t know exactly where your friends are? Simple bust out your cell phone and you can have an instant picture of exactly where your friends are. You won’t have to worry about losing your girlfriends by dancing with a cute guy, just make sure you have your cell phone on and you are good to go! Still another way that you could use this type of GPS tracking technology is as an employers to track your employees. This could be really useful for any number of reasons, but is sure to improve overall worker productivity and to make your operation much more efficient. Previous Previous post: Facebook Cell Phone Tracking Ad: Is This For Real? Next Next post: Who’s To Blame For Spouse GPS Tracking?